Banned several IP addresses for brute force attacking the FTP server. This should increase available bandwidth and response time. This is a problem I’ve been dealing with since I brought the server online many years ago. It’s a game of cat and mouse. New attacks will continue to occur almost daily which is to say on a daily basis I could be banning new IP addresses. I’m not sure I have that kind of time but I’ll check sporadically. Banned two .MPG cataloging sites for referring boatloads of traffic my way for the sole purpose of downloading model railroad .MPG clips probably in the hopes that the .MPG clips are something other than model railroading related. Their intentions seem clear to me. This should increase available bandwidth and response time. Removed all model railroad .MPG cilps from the web server. This should increase available bandwidth and response time. Upgraded GD Star Rating from version 1.0.1 to 1.0.2. Bug fixes and new features. I’m still seeing one bug with the product and have provided feedback to the author. Ratings are bells, whistles, and clutter and I’m half tempted to just get rid of them. Installed WP Super Cache. This should increase available bandwidth and response time. Please let me know if you see any funk that may be caused by serving static/cached pages instead of dynamically rendered PHP WordPress pages. Rob Bergin, who maintained the titles of Director of Systems Engineering, Director of Product Marketing, and Systems Engineer, has parted ways with the New Hampshire startup company VKernel. During Rob’s nine month tenure at VKernel, his responsibilities included development of the product roadmap strategy, documentation and creation of new features, and management of timely product release cycles. I wish Rob the best of luck in his new role of Director of Enterprise Infrastructure at CrunchTime! Information Systems. Rob, if you get that lab hardware website up and running, let me know. It looks like @gabvirtualworld can keep his job. He’s been using the beta version of Hyper9 which intuitively discovered that he had three VM snapshots open for nearly a year. Hey, anyone can forget. To forget is human. Forgetting about snapshots doesn’t make you a bad admin, but Hyper9 can make you a better one. See what Hyper9 is all about and grab one of the few remaining beta program invites today! Are you tired of seeing the Security Warning splash screen when launching the Virtual Infrastructure Client to connect to VirtualCenter? Do you feel a sense of guilt clicking the Ignore button or checking the “Do not display any security warnings for…” box? Are you flirting with real world dangers or risking termination for fostering a less secure virtual infrastructure? Would you like to correct the situation the right way by integrating SSL certificates and securing VIC/VirtualCenter communication at the same time? Here are the step by step instructions (originally created by VMTN forum member astrolab and refined by myself). Disconnect all ESX hosts from the VCMS (you can safely leave the guest VMs running or whatever state they are in). This step needs to be done because after the VCMS loads the new certificates, it will not be possible to gracefully shut down the VMs from the VIC, though it could still be done through RDP or COS. It’s best to perform this step to avoid future headaches. The steps are complete, but there is one important note going forward that deals with the inherent behavior of certificates and our certificate request outlined above: Use the Virtual Infrastructure Client to connect to the VirtualCenter Management Server using the FQDN (ie. server.domain.com). 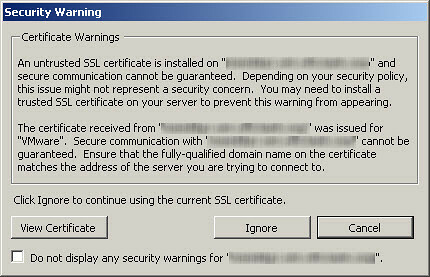 You can connect to the short NetBIOS name of the VCMS but at that point your connection won’t be covered by your certificate and you’ll once again receive the Security Warning dialogue box shown at the beginning of this article. The Hyper9 beta program is currently full, however, I’ve been extended the opportunity to offer exclusive beta invitations to a limited number of people. If you are interested in joining the beta program, please contact me. There are a few guidelines and requirements to becoming full members of the Beta experience, and I hope you are able to meet these. If selected, you must download and install the software within five (5) days of receiving the beta software. Can you do this? When you have completed the installation process of Hyper9’s software, we ask that you notify us that this action has been completed. Can you do this? Users from competitor companies are not eligible for participation. Users will have to provide Hyper9 with their company’s name and Web site information. Users will have to provide Hyper9 with their company email address for verification.